The Birdfinders week in Southern Israel (March 12th-19th) was typically excellent with migration in full flow, and a superb range of 'classic' key species making for a very successful tour. We also had a great week for owls, tallying five species, though in theory we might have seen as many as eight with a bit more luck. 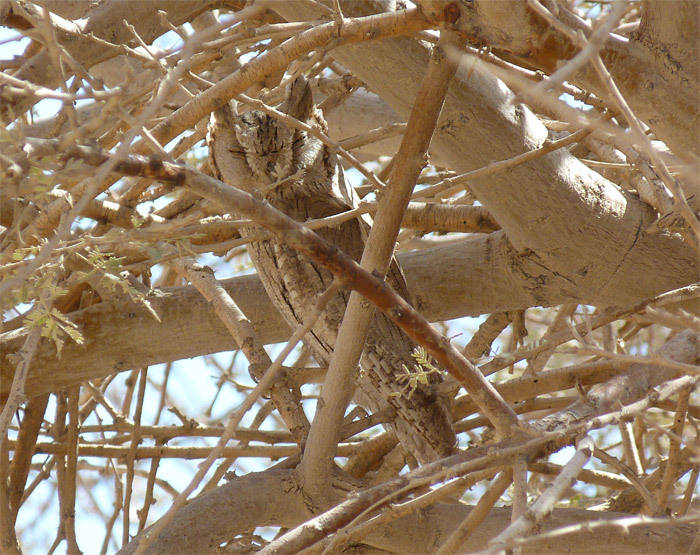 A personal favorite was Pallid Scops-owl, a species which I've surveyed twice in the southern Arava Valley in 2002/03 and again in 2003/04 with Susannah Lerman . 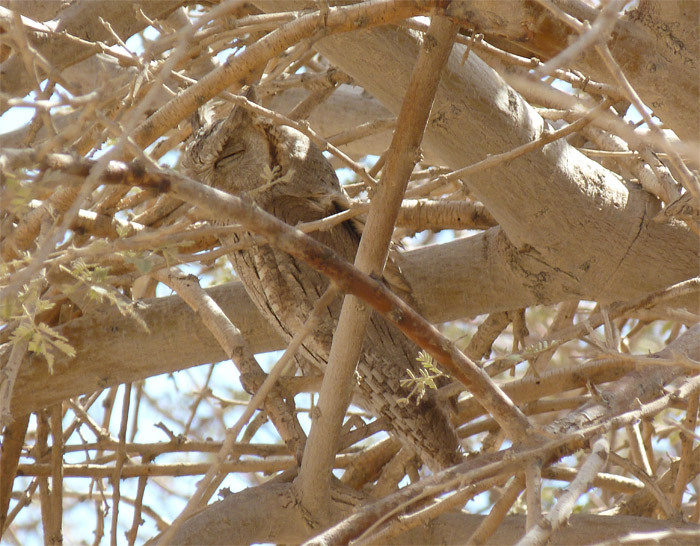 Traditionally thought of as a rare winter visitor to the Southern Arava, my extreme late date in spring was March 5th (2003) so I became especially intrigued when Itai Shani spotlighted a foraging bird several times in the Yotvata fields between March 4th and 7th. Then, remarkably, the Birdfinders tour came up with two more individuals - one at Yotvata (Km 50) on March 15th, and one in the Hiyyon Plains on March 17th. Both of these came from sites where I'd found birds on winter territories during the surveys so it would be impossible to determine whether these were on passage or late winter visitors. Either way, the presence of these birds added an exciting and otherwise unexpected element to the tour, especially with respect to the (more likely) possibility of migrant European Scops-owl occurring in the same habitat. I would have put my money on European rather than Pallid Scops on those dates! 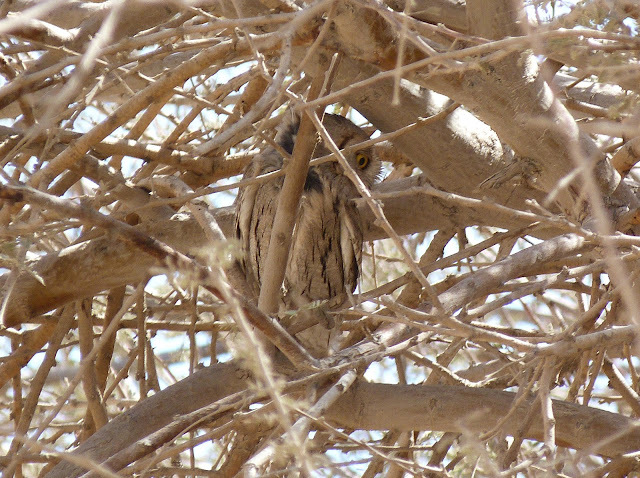 Pallid Scops-owl - Hiyyon Plains, Arava Valley, Israel. March 17th, 2012. Barn Owl - Neot Hakikkar, Southern Dead Sea region, Israel. March 14th, 2012. 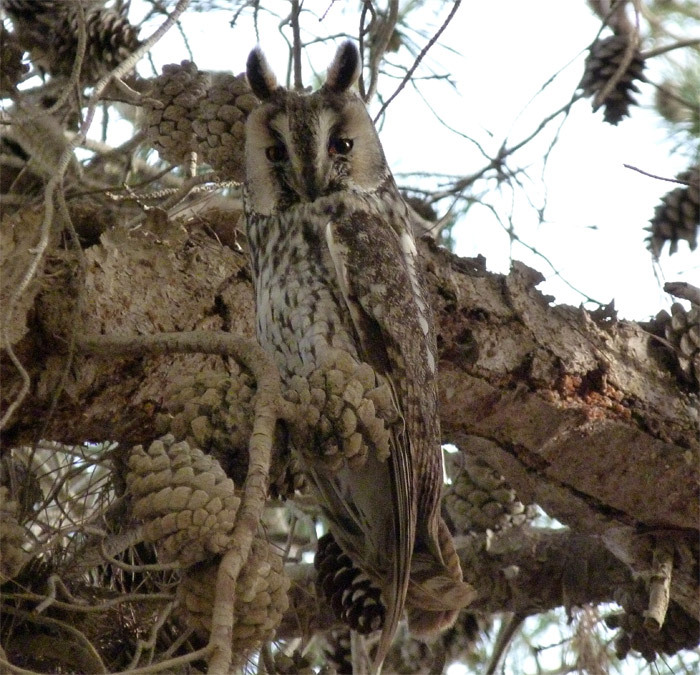 Long-eared Owl - Gevulot, Western Negev, Israel. March 14th, 2012. After spending a chilly week in Southern Israel, I would confess that I didn't expect to return to find Western Mass a lot warmer than the week I'd just experienced in the desert! Afternoon temperatures this week have consistently reached the 80s which strikes me as being ludicrous for mid-late March. Still, the balmy, foggy mornings have been perfect for listening for Woodcocks and they seem to be everywhere in Gill. Just this morning I tallied about 12 displaying birds on a six mile run covering Main, Boyle and North Cross Roads. Further displaying birds could be heard around the Main and Mountain Road intersection, all pre-dawn of course with birds starting up around 5 am. Killdeers appear to be present in most of the farm fields too, often vocalizing pre-dawn along with the woodcocks. Susannah tells me that the first Eastern Phoebes arrived at our home on the 15th, and certainly by the 20th it seemed like most of the homesteads along Main Road in Gill had at least one calling bird. Slightly less expected was a singing Pine Warbler in the White Pines at the Giving Tree School on Wood Ave, Gill on the 20th and the 22nd, almost certainly my personal earliest in the state and a species I wouldn't typically expect before April. Other chance sightings included a daytime Barred Owl at about 9am on North Cross Road, on the 22nd, and an American Kestrel on Main Road on the 22nd and 23rd. That bird was just north-east of Upinngil Farm. At home, a few Dark-eyed Juncos and White-throated Sparrows remain around the feeders, whilst Common Grackles, Red-winged Blackbirds and Brown-headed Cowbirds have become regular fare over the last few days, plus an occasional Belted Kingfisher on the brook. Gill - The day began cold but nice, with an American Woodcock displaying close to our yard at 05:20am. On my run I came across a further four, possibly five woodcocks on Boyle Street, Gill. Only the emerging dawn prevented me from recording others on my loop and I didn't hear them after 05:50am. A Hermit Thrush also called from a yard at the intersection with Boyle and North Cross, my first locally this year. Killdeers were also calling off Boyle Street in the pre-dawn with another seen in a field off Lyons Hill Road, Gill later in the day. I noted my first American Woodcock and my first local Killdeer of the year on February 29th. 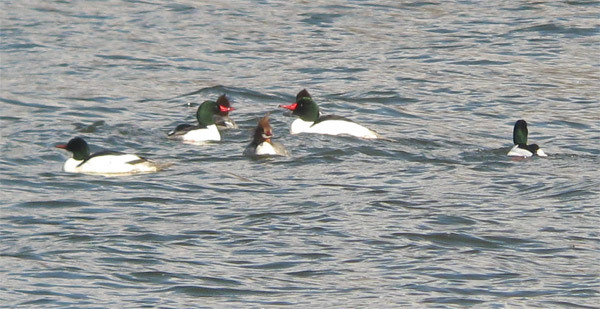 Common Mergansers - part of c. 85 present, Barton Cove, Franklin Co., MA. March 9th, 2012. Ring-necked Ducks - part of flock of c.80 with Greater Scaup (near center), Barton Cove, Franklin Co., MA. March 9th, 2012. Canada Geese - part of a mass of c.1800 birds, Turner's Falls power canal, Franklin Co., MA. March 9th, 2012. Gadwall - male (left) with Black Ducks and hybrid (right), Barton Cove, Franklin Co., MA. March 9th, 2012. By mid-morning I was keen to get a sense of migration which has certainly gathered momentum over the previous two days. I headed down to Barton Cove and wasn't disappointed. The cove was full of newly arrived Ring-necked Ducks (c.80), and some scaup (5 Greater and 3 Lesser Scaup), plus Mallards, Black Ducks and a pair of Gadwall. Over 80 Common and 2 Hooded Mergansers were also present, dodging several marauding Bald Eagles seemingly intent on stealing the mergansers catch. 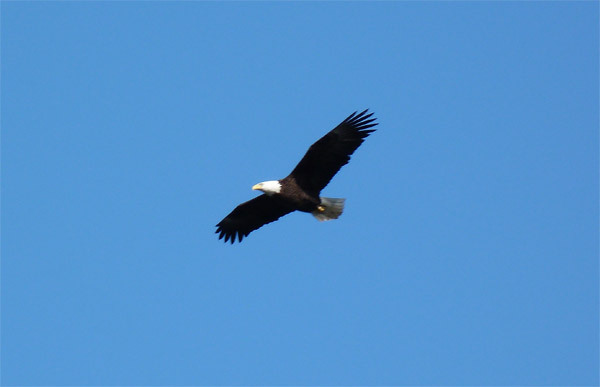 I would admit to being more than a little surprised to see six Bald Eagles in the air together, including four adults - all the birds were in the heart of the territory of the resident pair. Not wanting to neglect the power canal, I then headed down to Turner's Falls, timing my visit perfectly for a sudden mass-arrival of 1800 Canada Geese - quite the spectacle. 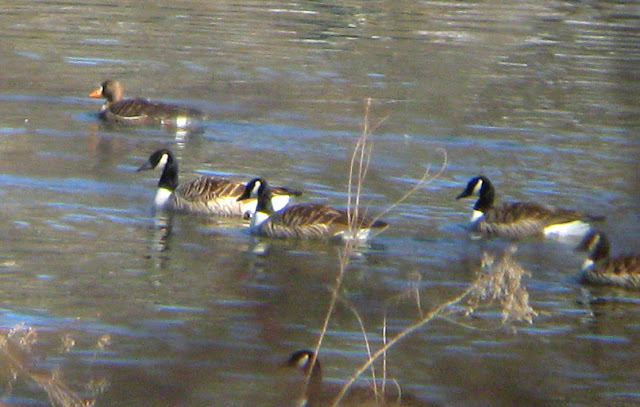 Despite much effort, I couldn't rustle up any of the rarer geese and they all appeared to be Canadas. Six Ring-necked Ducks were present here too, along with with about 6 Common Goldeneyes and another Bald Eagle. 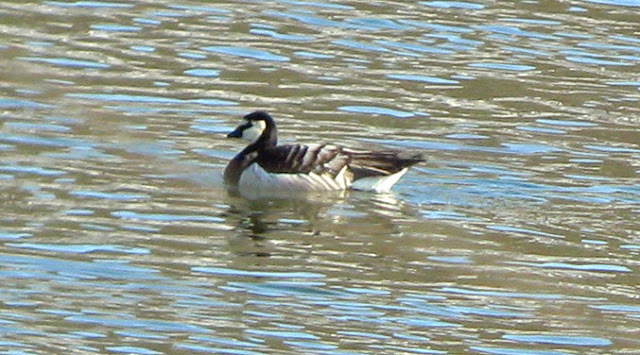 MA - Greater White-front in Gill! After dropping Matan at nursery school, I started to drive a short loop around Gill as I do most days before heading back to the house. 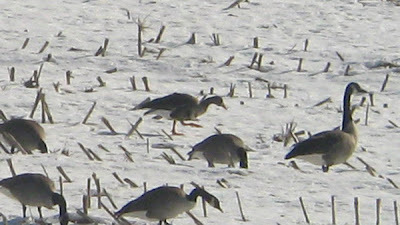 This morning I was pleasantly surprised to find about 120 Canada Geese feeding in the large corn-stubble field to the NE of Main and Munns Ferry Roads. 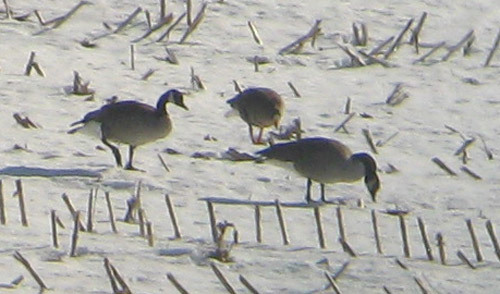 The field is huge and the birds were distant, but a quick binocular scan produced a notably smaller bird - my first thoughts being Cackling Goose. 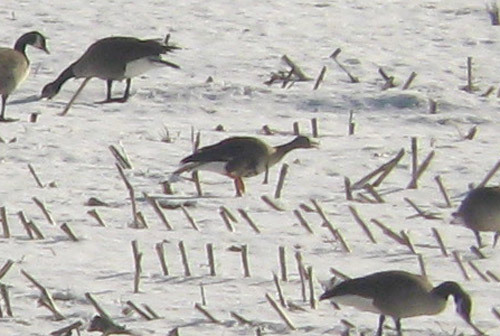 However, scope views revealed it to be a fine Greater White-fronted Goose, my first in Gill. 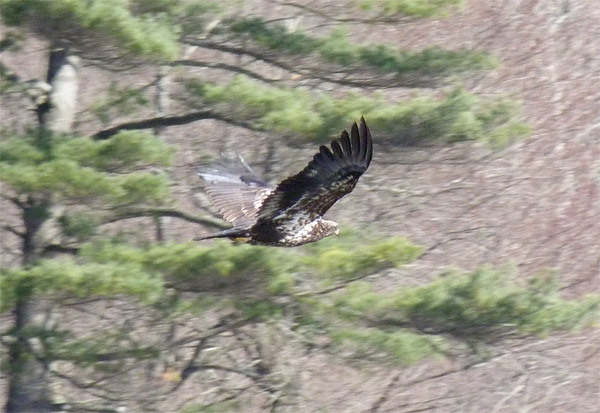 I immediately began to entertain thoughts that this and the bird I saw in Vermont the previous day were one in the same. It looked very similar indeed and like yesterday's bird, it appeared to show characteristics of the Greenland form A. a. flavirostris. 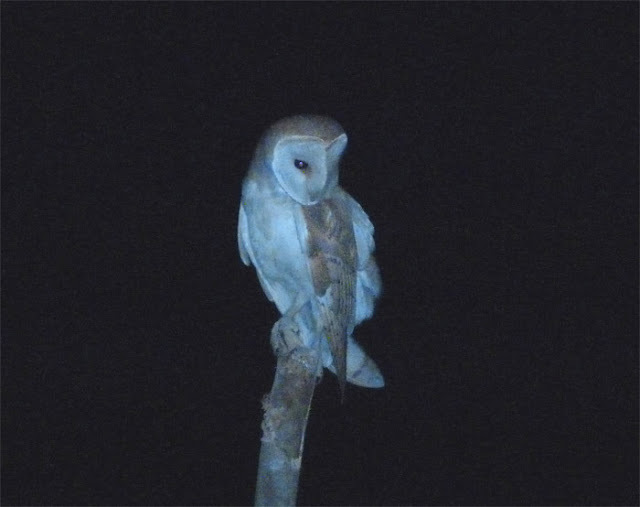 Despite the distance, I still attempted, and came away with, a few digi-scoped record shots. Greater White-fronted Goose - Main/Munns Ferry Road, Gill, Franklin Co., MA. March 7th, 2012. Apologies for the lack of blog posts lately. 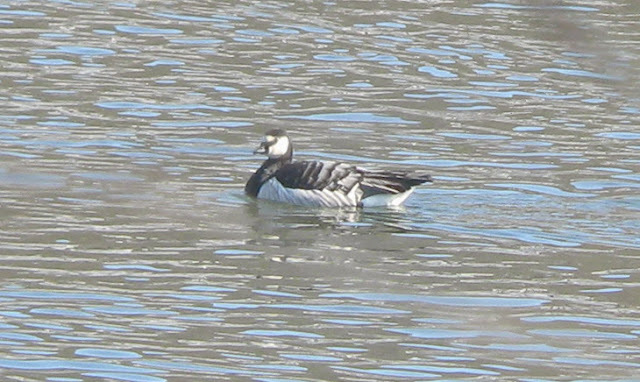 A crashed laptop and a week's family vacation in Phoenix have certainly affected my ability to post, but news of both Barnacle and Greater White-fronted Geese just up the road saw me heading straight into southern Vermont this morning. Both birds were found by Dave Johnston on Sunday and by some great stroke of luck I ran into Dave during my search for the geese this morning. Had it not been for Dave's guidance and local knowledge, I would have certainly missed them. The geese had found a cozy, well protected spot on the CT River, east of a large cornfield off Stebbins Road, and were roosting around a small island. Conditions were not easy, scoping down onto the river through trees but it wasn't too long before we picked out both birds and then had an enjoyable time tracking them up and down the river. 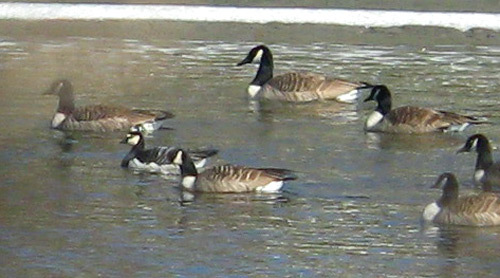 Dave tells me, technically, that all the geese (c. 500 or so) were on the New Hampshire side of the state line. Plenty of Mallards and Black Ducks were also present, along with some Hooded Mergansers, 1 Common Merganser and a number of Common Goldeneyes. Also, four Turkey Vultures in the fields and several fly-over Horned Larks. Gracious thanks to Dave for taking me to this 'sweet spot' for geese - I doubt if I would have found it without him. Barnacle Goose - Connecticut River, Vernon/Hinsdale, VT/NH, March 6th, 2012. 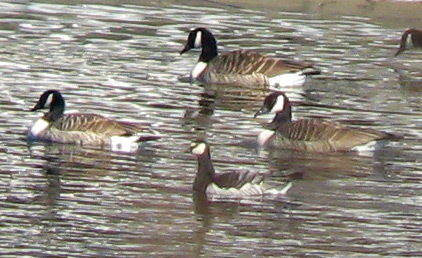 Greater White-fronted Goose - Connecticut River, Vernon/Hinsdale, VT/NH, March 6th, 2012. 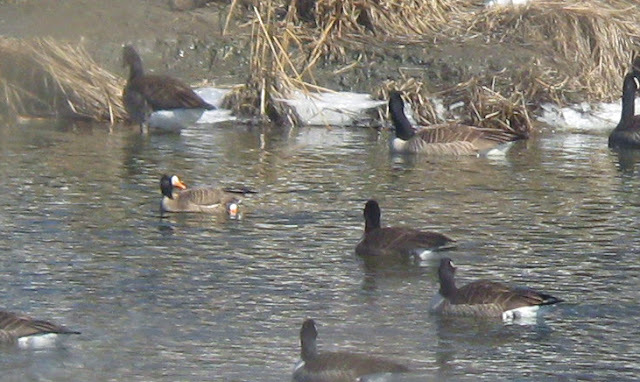 Bright orange bill, strongly indicating the Greenland form (A. a. flavirostris) along with narrow fringes to the upperparts and a noticeably narrow white line along the flanks.